Every April, there are many events and festivals in different areas of Gunma related to hanami, flower-viewing. This season is a perfect time to go out and hang out at a park with your friends and family. It's a good idea to bring a bento/lunchbox and have a picnic under the trees. This month, we will introduce you great hanami events and spots in Gunma. We hope you enjoy this beautiful season of fresh air and warm sunlight. Annually, many people visit the south side of Mt. Akagi to see the senbonzakura/1000 cherry trees in bloom. 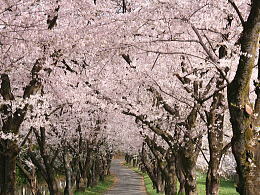 When full bloom, the trees, planted on both sides of the road, create a flower tunnel. This spot was selected as one of the best cherry blossom spots in Japan. Cherry blossoms are not only beautiful in the daytime, but also look gorgeous lit up at night. Enjoy the fantastic view of the ground, covered in moss pink, and other flowers such as azalea, in bloom all over the park. Taking a walk under the glorious sky at this park will be so refreshing! Agatsuma-machi is the number one producer of suisen/narcissus, the town flower. This event is very unique because you can enjoy both suisen and sakura at the same venue. The invigorating pink and yellow colors create such a lively atmosphere. 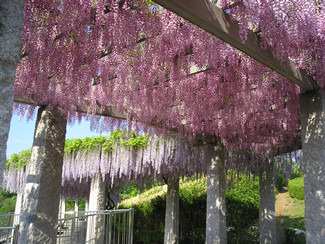 Every year, many people come to see Fujioka's wisteria. 45 different types of wisterias bloom at this park. What makes this park different is the way the wisterias are displayed. The flowers are hung from the ceiling of the arcade! When walking through this arcade, you will enjoy the calming scent of the wisteria. Maebashi will host the Flower and Green Festival this year. This festival is designed to make the city and the community more vibrant and lively. You will see beautiful flowerbeds with different shapes and many types of flowers. During the festival, there will be fun events you can join and a stamp-rally. Also, as this year marks 120 years since the municipal government of Maebashi was established, Maebashi-shi will be hosting exciting events and projects to celebrate this anniversary. For visitors of and those new to Maebashi, please visit the city's multilingual site. 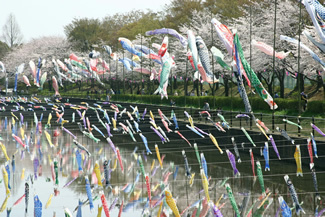 At five sites in Tatebayashi city, more than 5,000 large and small decorative carp streamers swim in the spring wind and above the river. Enjoy the spectacular view of these once a year streamers.